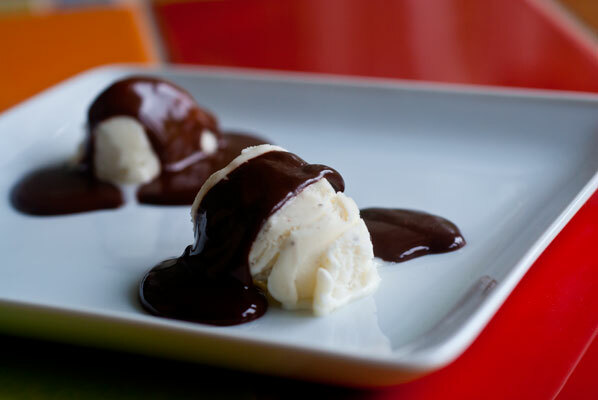 I still remember my first taste of Hot Fudge Sauce. It was in a Tin Roof Sundae at Farrell’s Ice Cream Parlour, in the Lougheed Mall – the same mall where my mother sold shoes at the Hudson’s Bay Company. I had never tasted anything so rich and exotic. It was a warm sauce on cold ice cream! And salty red skinned peanuts to top it all off! After that first taste, it became a weekly ritual for me to go with my Dad to pick my Mum up from work on Friday nights, at 9pm. My professed reason was to see Mum that much faster, but the real reason was the hope that Dad could be convinced to take us to Farrell’s, afterward. Poor Mum probably just wanted to go home and put her tired feet up, but she was a good sport, and gamely went along for “a wee treat”, to the hyper-cheerful “ye olde fashioned ice cream emporium” staffed by servers in striped shirts and boater hats, the player piano belting out tinny Gay ‘90s songs. I loved that place. It was like something out of the American kids’ books I devoured. I got them to make the sundae without the maraschino cherry on top (regular readers of this blog will know I despise maraschino cherries), but “with whipped cream please, if it’s real”. I absolutely loved the pool of thickening fudge sauce, with peanuts embedded in it, which would remain at the bottom of the parfait glass, when the ice cream was gone. After I ate it, I would inevitably have a slight stomach ache all the way home. I didn’t mention this to anyone, as I didn’t want to jeopardize my chances of a return visit. Years later, when I was pregnant with my first son, once I had settled into my blissfully uneventful second trimester (the first one having been spent with my head in any toilet I could find), I cheerfully gained twelve pounds in one month, satisfying cravings for those wonderful Tin Roof Sundaes of my childhood. Farrell’s had long since gone out of business, but the White Spot (a famed Vancouver restaurant chain, who also made beef dip sandwiches – another craving) I discovered, made a decent one. By the time I was pregnant with my second son, they had stopped making them (something to do with not being able to keep fresh a stock of Spanish Peanuts for only one menu item), and I knew I would have to make ‘em myself. 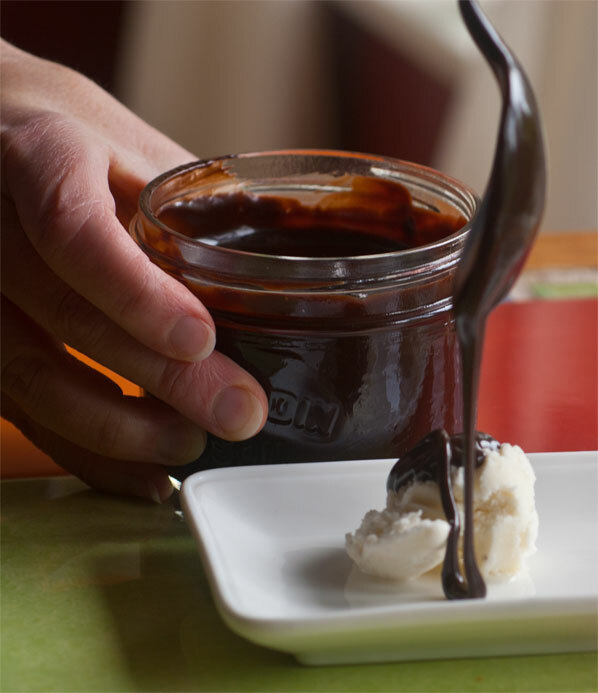 Fortunately, I had a copy of Susan Mendelson’s Nuts About Chocolate which contained a recipe for a Bittersweet Hot Fudge Sauce, rich with not only heavy cream, but butter to smooth out the edge of the cocoa. Amazing that I only gained twelve pounds! That cookbook has remained my trusted friend for many years now, and is dog-eared and spilled upon, as any good, well-used cookbook should be. I love that recipe, but am ALWAYS looking for a great new one. This probably shows some sort of subliminal lack of commitment – but I prefer to think of it as an adventuresome spirit. Now, f I only had some Spanish Peanuts … and my stretchy pants. So, I am poised to try five new recipes. 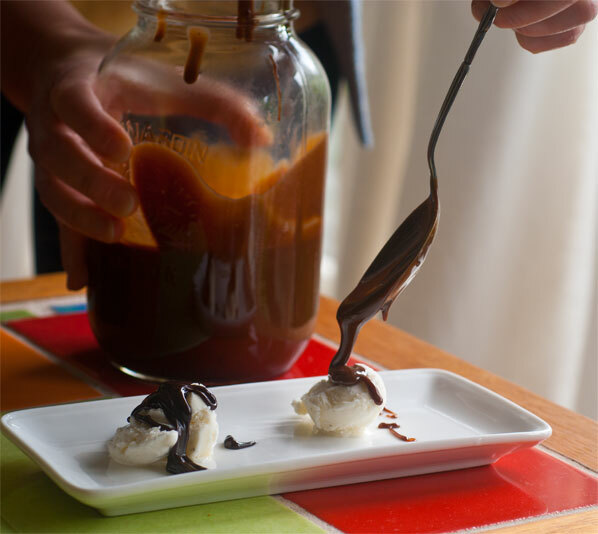 There are as many versions and methods for how to make chocolate sauce as there cooks, with as many “secret” ingredients and “swear by” methodologies. With so many variations on a few ingredients, what is the best base? Unsweetened or bittersweet chocolate? Cocoa? And for the liquid: is it to be heavy cream? Evaporated Milk? Condensed Milk? Water? Any sweeteners? Honey? Corn syrup? Brown sugar? Since the actual recipes for these sauces require so little investment of time, I have indulgently set aside this morning to make them all, and have my panel of expert tasters standing by to decide which ones they prefer. 1. I begin with an interesting alternative recipe, thanks to Tiffany, at The Gracious Pantry. 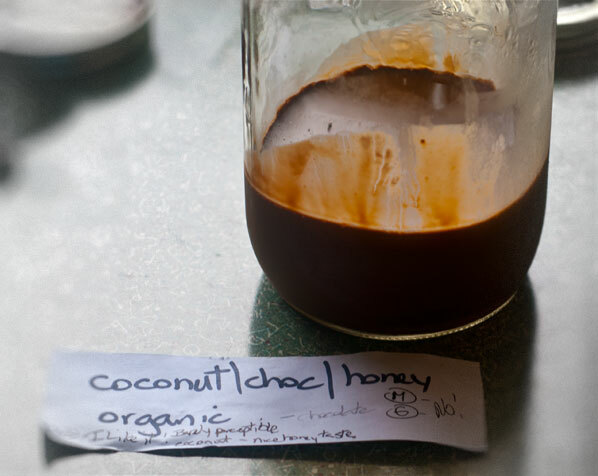 This is a sauce featuring bittersweet chocolate and coconut milk, flavoured with honey. I love organic coconut milk, and always have a couple of cans of it in my pantry, and I just picked up a block of Vivani Organic Couverture Chocolate. I have some local lavender honey, so I am good to go. It is a very easy, quick recipe, and although she doesn’t ask you to chop the chocolate, I did, and the whole thing came together, and blended into a nice smooth emulsion much faster than the 8-10 minutes recommended. It really thickens up when cooled. I loved this one. An almost imperceptible hint of coconut, and a nice full honey taste. The boys really DIDN’T like this, finding it “medicine-y”. 2. 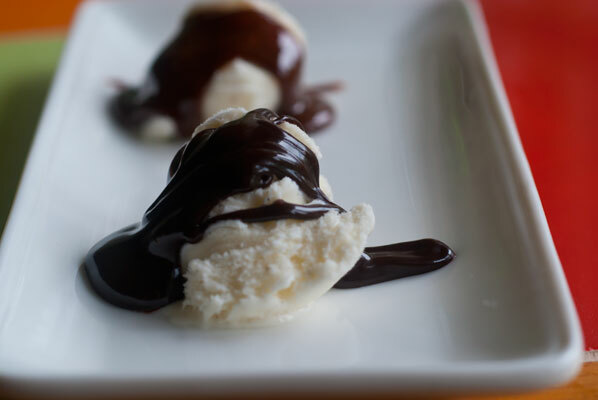 The next one I try is called Sue’s Hot Fudge Sauce, and can be found at this website. I wanted to feature one sauce made with evaporated milk, as it seems to do wonders for some kinds of fudge, and I hoped would produce a nice smooth product. This recipe asks that you put the whole thing through the blender, at the end, which initially produced a great quantity of air bubbles, but a good whack of the container on the counter seemed to settle it. This was the one which required the greatest amount of butter, and of boiling (7 minutes). Made with cocoa, it produced a sauce of medium brown colour. To each their own: the boys really liked this one. Found it clean and simple. I found it way too sweet, and I found I could taste the cocoa, as opposed to the ‘nap’ of chocolate. 3. On to the “Winnie the Pooh” recipe, featuring condensed milk and semi-sweet chocolate. The first time I ever heard of condensed milk was in the story where Pooh eats too much and gets himself stuck in Rabbit’s house, and I can never hear of it without thinking “Honey or condensed milk on your bread, Pooh?” “Both please, Rabbit dear – but don’t bother about the bread”. We all liked this one. I wasn’t blown away by it. I prefer a darker, slightly more bitter taste, but it was rich and smooth. The boys found it tasted the most ‘cholat-ey’ of them all. Because there is no added sugar (as the condensed milk is loaded with it, already blended in), it is very quick to assemble, everything melting together rapidly, with a quick stir-in of vanilla at the end. 4. 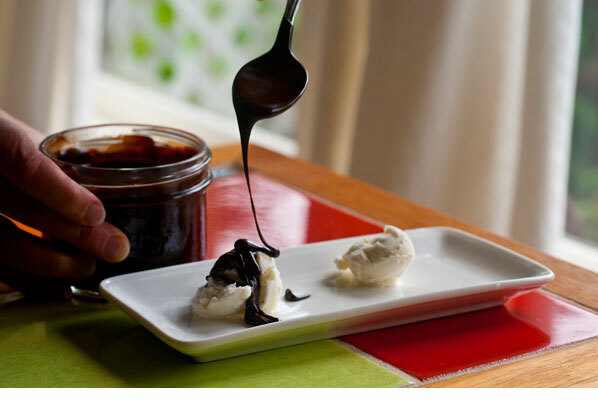 This is David Lebovitz’ Classic Hot Fudge Sauce, from The Perfect Scoop adapted by Diane . I love just about every recipe of David Lebovitz’ I have read, and this is a lovely, simple one, which manages to produce a dark, thick sauce. This, according to my tastes, is BRILLIANT. Deep, dark, rich bittersweet taste, rounded off by the richness of the cream and butter. A satisfying mouth feel. The boys found this one “Meh – a bit bitter” and “Just OK”. I didn’t try to sway them. This means there will be more left for me! 5. The final sauce is thanks to my dentist, although I don’t know if she would want to take credit. I found this recipe, in her reception area, in a recent issue of my favourite magazine, Canadian Living. They have re-printed the recipe online. These are a few of my favourite things, as the song goes, and it smells like a little bit of heaven, as I stir the cinnamon into the thickening sauce. I love that our family is so far apart on the tasting spectrum, on these sauces. So many variables come into play, including heat of the sauce, how much the ice cream has softened, how the sauce hardens (or doesn’t). I also love the fact that it looks like I won’t have to share the ones I like. … although, of course I would!